Ayala Land is investing P60 billion in Makati within the next five years. This includes the P20-billion redevelopment of Ayala Center. 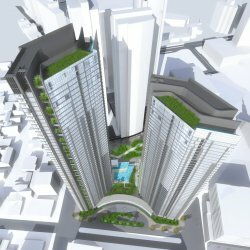 The 60 storey luxury tower of Garden Towers, the latest offering of Ayala’s high-end brand, Ayala Land Premier is the symbol of Ayala Land’s commitment to incorporating greens in its integrated mixed-use hubs across the country. The 2 tower development features pockets of greenery or “sky gardens” that will be laid every two floors. Ayala Land Premier presents a relaxing transition from urban to green with Garden Tower’s special features. For inquiries or viewing, feel free to ask.